President Donald Trump declared last week that the US will get out of Syria “soon,” on the heels of halting $200 million of taxpayer money to reconstruct the war-ravaged country. Naturally, this pair of announcements set off alarm bells within the US military, corporate media, and think-tank establishment, as well as among allies that want Washington to maintain its military occupation of Syria and the Middle East. “We believe American troops should stay for at least the mid-term, if not the long-term,” said the Saudi Crown Prince, who wants to use US military power to counter Iran in their competition for regional hegemony. Israeli and European allies echo that sentiment. However, Trump wants regional countries such as Saudi Arabia to play a greater role and pick up the bigger portion of the bill in Syria, and for Europeans to do more since displaced Syrians mainly wind up as refugees in Europe. Many Syrians are also fleeing jihad at home to neighboring Jordan, Lebanon, Iraq, Egypt, and Turkey. With Saudi Arabia, Qatar, the UAE and other wealthy Arab Gulf states agitating for regime change and increased military escalation, one ponders how many refugees they have taken? According to director of Human Rights Watch Kenneth Roth, zero. Even worse, Riyadh is creating thousands of refugees of its own by bombing Yemen, a campaign that has already killed more than 10,000 civilians and wounded 40,000 others, including 135 at a wedding party, mostly women and children. There are actually various legitimate reasons for Trump to pull back from Syria: a $21 trillion national debt bomb; the riskiness of the US dollar as a fiat currency that solely relies on confidence in the government and is not backed by actual gold or silver; crumbling domestic infrastructure that needs a complete overhaul; $5 trillion of taxpayer money spent in wars in Iraq and Afghanistan alone that is projected to top $12 trillion by 2053; over 40,000 homeless veterans throughout the country with many committing suicide while waiting for treatment, many from “regime change” wars in the Middle East; Trump’s pledge to “Make America great again” and not “Make Syria great again” or other nation-building efforts in the Middle East. So why is the Washington, DC establishment pushing for US mission creep in Syria? As Josh Rogin of the Washington Post revealed, it’s about taking the oil. The current US occupation of Syria is in the northeast and covers 30% of the country’s territory and controls oil fields where about 90% of the pre-war oil production took place. However, according to some Syrian analysts, the amount of oil revenue is negligible and insufficient to even pay for local government. Nonetheless, Syria has a bigger prize located elsewhere – in the Golan Heights. As mentioned previously in an Asia Times article, in November 2015, Afek Oil and Gas, a subsidiary of the US company Genie Energy, discovered an oil bonanza in the Golan Heights “with the potential of billions of barrels.” Genie Energy, boasting an advisory board studded with former US cabinet officials, managed to obtain exploratory licenses despite opposition from environmental and local groups concerned that drilling could pollute the Golan countryside and the Sea of Galilee below, the source of most of Israel’s drinking water. However, the biggest problems revolve around the issue of sovereignty. Israel annexed much of the Golan in 1981, but it is still regarded internationally as illegally occupied Syrian territory. Israel’s leaders had previously offered to pull back from the Golan, which was captured in 1967, in return for a comprehensive peace treaty with the Syrian government. However, since Syria began disintegrating in 2011, there are efforts to demand recognition of Israeli control of the 1,200 square kilometers it occupies in the Golan Heights. 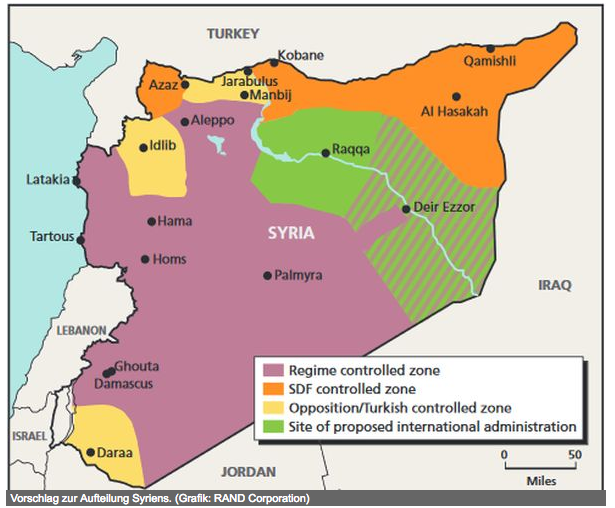 In the case of Syria, the US would be in the northeast, Turkey in the northwest, Russia and Iran in the coastal area and large parts of the Syrian desert, Israel and Jordan in the southwest, according to a partition plan by RAND Corporation and first published by the German newspaper Deutsche Wirtschafts Nachrichten. It is interesting to note that in the US plan, the area of Manbij is in the Turkish sphere of influence. As such, it is unclear whether American troops would continue to support the Kurds there, as Erdogan’s army and jihadi shock troops continue to advance towards the area to occupy territory west of the Euphrates. And despite Syrian government’s proclamations that it would reclaim all lost territory, from the current vantage point, it does not seem very likely. Like China, it may need to wait another century.